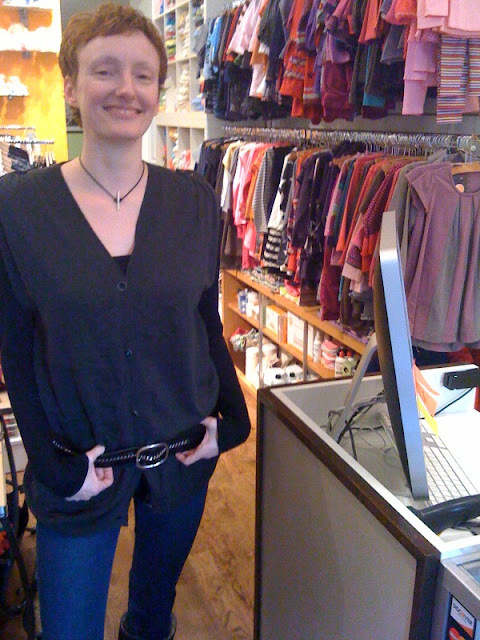 Kristy Cammeron manages Belly Bum, a gorgeous concept boutique for moms/babys/kids in Lincoln Square. She called me one frenzied pre-Xmas morning in serious want/need of a toggle necklace. Understanding the urgency, (jewelry emergencies are real) the MarLa-mobile swung by the very next day. As soon as I saw Kristy I had a "wow" moment! OOOOH! It's her! The incredibly cool, stylish, intriguing, hipster chick I've seen in the 'hood before! She saw the necklace on the owner - Ellen Sternweiler - after Ellen bought it from me at Chicago Printmakers Collaborative (incredible place which I'll blog about soon!). Unfortunately I missed seeing Ellen at my drive-by-drop-off or she'd be in the pic too. AND... Yes - Kristy is as real, fun, funny and terrific as I imagined her. A most happy, satisfying ending to a very cold, busy day.